Confirm the level of service. VICOM has announced the new CoLT-250S SHDSL test set from Consultronics Limited, a specialist in the design and manufacture of sophisticated, portable telecommunications and data test and monitoring equipment for access technologies. SHDSL (symmetrical high-speed digital subscriber line) is emerging as service providers' access technology of choice for symmetric service offerings for business and SOHO customers. The technology is well suited to bundled internet data, digital voice transport and real-time video conferencing. Since the various services are handled in the digital domain, bandwidth can be dynamically allocated between voice, video and data. SHDSL is expected to become the most common solution for symmetric access (offered by major service providers worldwide) starting in 2003. 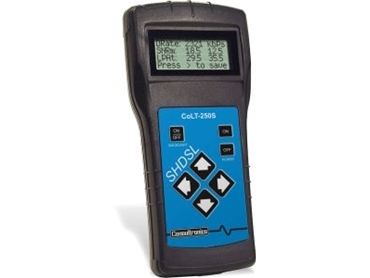 Consultronics has recognised this need for an affordable and easy-to-use SHDSL test set with the introduction of the CoLT-250S. Service providers will use the test set to confirm that the promised level of service is met during new subscriber installations. The CoLT-250S can quickly confirm the presence and speed of the SHDSL service at the customer premises, from 192kbps to 2.3Mbps. The CoLT-250S is so simple to operate that technicians can learn to use it in minutes. Simply connect the CoLT-250S to the circuit to be tested, turn the unit on and in seconds, the unit synchronises with the SHDSL DSLAM and displays the test results on the built-in LCD screen. The CoLT-250S is built around an actual GlobeSpan SHDSL modem chip set, so it is compatible with all GlobeSpan G.SHDSL DSLAMs. * Quick confirmation of SHDSL service at the customer premises. * Runs a test at the single push of a button. * Saves time and reduces the guesswork in SHDSL installations. * Eliminates call-backs and return truck rolls. * Can trace SHDSL signals through the loop plant. * Multiple results can be saved for later analysis. * Results can be uploaded to a PC as a permanent record. * Attaches directly to the copper pair via telco clips or RJ-45. * Upgradeable via the integrated RS232C/V.24 interface.